Parents worry when they look in their child's mouth and see a permanent tooth growing behind the baby one, as the baby tooth usually becomes loose, falls out and then the permanent one starts growing in its place. Permanent teeth growing behind baby teeth are not an emergency! The norm is for the permanent teeth to push up and the roots of the baby teeth dissolve, causing the baby tooth to fall out. The permanent teeth then have space to erupt. 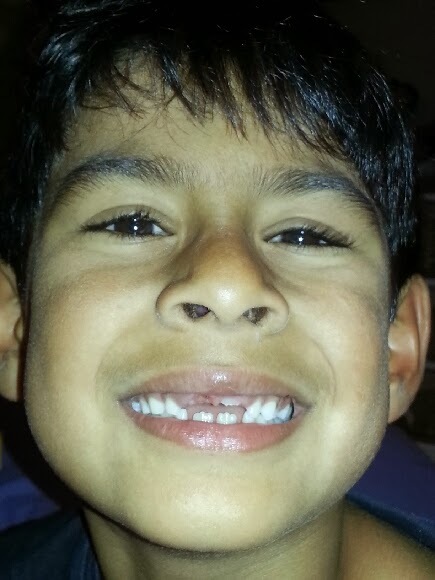 Sometimes, the baby teeth don't want to leave the mouth, and the permanent teeth come in right behind them. This condition is technically known as lingually erupting mandibular incisors or shark teeth. There are a few ideas as to why shark teeth occur. Some dentists believe that this occurs because the roots of the baby teeth don't dissolve like they normally should and because of this the permanent teeth have nowhere else to go and come into the mouth where there is the least amount of resistance. Others believe that the permanent teeth start growing behind the baby teeth because there is too much crowding in the lower jaw. Another theory is that the permanent teeth develop behind the baby teeth because they just didn't make it as far forward as they should have. All three are possible explanations and any of them might be true for a specific individual. If your child's shark teeth fail to resolve on their own within a couple of weeks, ask your dentist to take a look. Removing the baby teeth usually resolves the problem.